At some point in 1983/4 someone at Acorn decided that having conquered the schools market they should have a stab at conquering the business market, or at least making a dent in it. They already had the base of what could be turned into a business machine with the BBC B+ 64K, though admittedly the B+ (and the 128K) was a stopgap machine in its own right - the BBC Master series was on the drawing board but not ready for production so something had to be released to hopefully make schools buy more BBC machines. 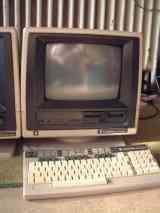 A small team had been beavering away on a substantial modification to the B+ platform that was to be designated the ABC range, Acorn Business Computer. There was to be 4 models starting with the pretty much dumb terminal 200, through the National Semiconductor 32016 co-processored 210 to the Intel 80286 co-processored 300 and 310. 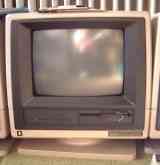 However, at about this time Acorn hit financial problems because schools that wanted BBCs had them and didn't want new ones and there was nothing else on the go - the Electron was pretty piss-poor to be honest and wasn't selling well. All hopes were pinned on the ABC range. Oh, and a financial rescue package from Italian typewriter maker Olivetti. However, the ABC range wasn't well received at all initially though its 32016 based model (ACW or ABC-210) went on to do quite well in UK Universities and apparently the RAF. Initial impressions were of 'a vastly oversized monitor on a tilt-swivel stand' and 'sheer ugliness' (PCW Apr 85). For a while I was custodian to not only the ACW but also the seemingly uber-rare ABC-310 as mentioned above. I say uber-rare because everytime we find someone who had one in the past it was apparently this machine that they had. What are the chances etc. Both are featured in the pix below along with a spare case. No, I don't have the 310 any more.